Some weeks seem longer than others, and if your routine consists of commuting to and from work, arriving home, spending a few hours with family, and then doing it all again the next day, it might feel good to shake things up a bit, get out of the house, and let loose with a group of friends. The neighborhood bar seems like a good option, but you want to do more than stare at the television across the bar. Instead, hit the town to play a stimulating round of trivia, and even walk out with extra cash in your pocket! Trivia Time Live is a Pacific Northwest team trivia brigade that hosts trivia in Kitsap County almost nightly, with two of these events taking place on Bainbridge Island and one just across the bridge! Instead of a quiet bar and monotonous questions, these trivia games are bustling with energy, featuring good music, food and drink specials, and a rambunctious crowd ready to have a great time. The entertaining hosts (including our beloved Jane Darrah) prepare each trivia night with a roster of stimulating questions, and teams compete for a prize or pennant to stake your claim as reigning champion. You may surprise yourself with how well you play—seemingly useless information can make the difference between a team success and fueling your fire to win next week. For a weekday getaway, head to the Bainbridge Island Brewery & Taproom on Thursday nights from 7-9 to enjoy fantastic local beer and an absolutely full house of happy trivia goers. Come alone, or play on a team at the brewery trivia events—dogs are welcome, so bring in your canine companion for some moral support! 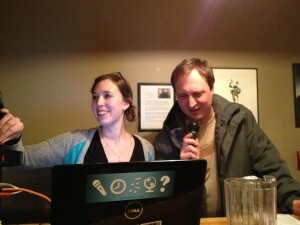 Another trivia event on Bainbridge Island takes place on Saturdays at Island Grill, starting at 8 PM. Here, you can order from a full menu and have a cocktail from the friendly bartenders behind their full bar. Just outside the island, Suquamish’s Clearwater Casino entertains Trivia Time Live every Wednesday in the Beach Rock Lounge starting at 8 PM. Teams can have up to 10 players and compete in four rounds of trivia. At halftime, the leading team gets a round of drinks for half price, and there are cash prizes for placing in the top three teams! Follow Team Trivia Live on Facebook to read the weekly hint that can be used as a clue to answer a bonus question, chat with other Trivia Time teams, and stay excited about spending a night out with friends sharing drinks and laughs, and maybe even a winning prize! It’s here—the time we’ve been waiting patiently to enjoy, when the sun hangs high and long, and suddenly Bainbridge Island is exactly what it sounds like: a summer paradise. Island neighborhoods begin to resemble each other, with windows swung open, fruit trees dropping apples and plums, paddleboards strewn across front yards, multicolored chairs encircled around a fire pit, bicycles, sailboats, panting dogs, sprinklers, budding gardens, and the echoes of playful laughter as the sun sets in vibrant hues across the sky. Fall, winter, and spring have prepared this island for three months of summer splendor. During those colder, wetter seasons, the island feels cozy and normal, a place where people live, work, and enjoy the Pacific Northwest life. But, when summer comes along, we all drink the Kool-Aid. Out come short shorts, daring wake surfers, and bronzed sea kayakers swarming the coasts while cyclists and joggers enjoy the shaded forest roads. Tourists pour from the ferry boats, with unfolded brochures stretched before them, wondering where the can travel to experience the best of Bainbridge Island—its natural beauty. While many of us are frequenters of swimming and hiking spots on the island, some folks are new, or simply traveling and trying to enjoy every last drop of sunshine while here. So, here’s some advice on a few local (but not too local, don’t worry) spots perfect for swimming and hiking. Although we’re on an island, much of the coastline is inaccessible. There are a handful of public beaches perfect for an afternoon in the sun, hidden away from larger channels of cold water. Manzanita Bay is a cove on the island’s northwest coast with a public beach access on Dock Street. Here, water tends to stay slightly warmer and the beach less windy with full sun exposure. During low tide, the access point has a small, sandy beach area from which you can enjoy front row seats to a spectacular view of the Olympic Mountains while swimmers travel back and forth from the floating dock in the center of the bay. Be cautious of private property while swimming at Dock Street—make sure that you’re not parking, swimming, or beach combing beyond public limits. Point White Pier is a different swimming experience. A big hit among the crowds of youngsters on the island, this pier is located along the incredibly scenic Crystal Springs Road on the southwest end of the island. With parking across the street and well-marked signs along the way, the dock can host large groups of daring jumpers. With a wooden ladder nailed along one of the pilings, the fun is in the rush. 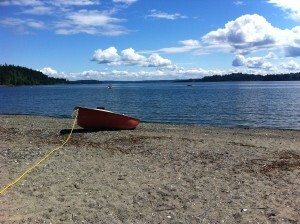 Jump in and experience the rejuvenating, cold Puget Sound water tingling your skin. Some are tough enough to skip the ladder and swim back to the rocky shoreline. On hot summer nights, head to Point White Pier to watch the bioluminescence—tiny organisms that become phosphorescent when disturbed, like glowing glitter underwater—dance off of the pilings beneath the dock and burst into a glowing show as you swim amongst it. The healthy, vibrant forests on this island make for an incredible and fulfilling day of hiking. With innumerable plant and fungus species to identify, as well as old growth trees and dripping moss, it’s easy to lose track of time in the Grand Forest, located in the center of the island. Multiple trails branch from trailhead parking lots at either Mandus Olson Road NE or Fletcher Bay Road, which lead you beneath the canopies to a beautiful open field in the center of the preserve—a wonderful place to take a breath of fresh air and watch the clouds pass by. Gazzam Lake rests on the southwest end of Bainbridge Island. This trail has a wide variety of attactions, from coastal to lake access. 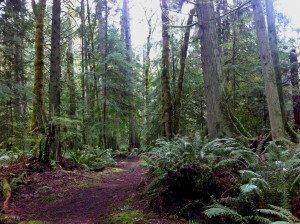 A trail—perfect for an evening run—winds through the healthy forest with many tree species living amongst each other. During dusk, listen carefully for the owls living in the trees. An access to Gazzam Lake provides a spectacular view of flora and fauna that thrive in freshwater ecosystems. If you’re interested in hiking down the steep coast to the water, enjoy a beach view of Port Orchard during a long and colorful sunset. Fresh Connections – The Parfitt Way Blog is is using the Woodpress theme designed by Magnus Jepson. Powered by WordPress.